If you're a parent with a young infant, you know all too well how prohibitive the cost of child care can be. But how does the cost of care differ from state to state? And how do child care expenses compare to other large expenses, such as college tuition and rent? We were curious, so we decided to do a little digging. 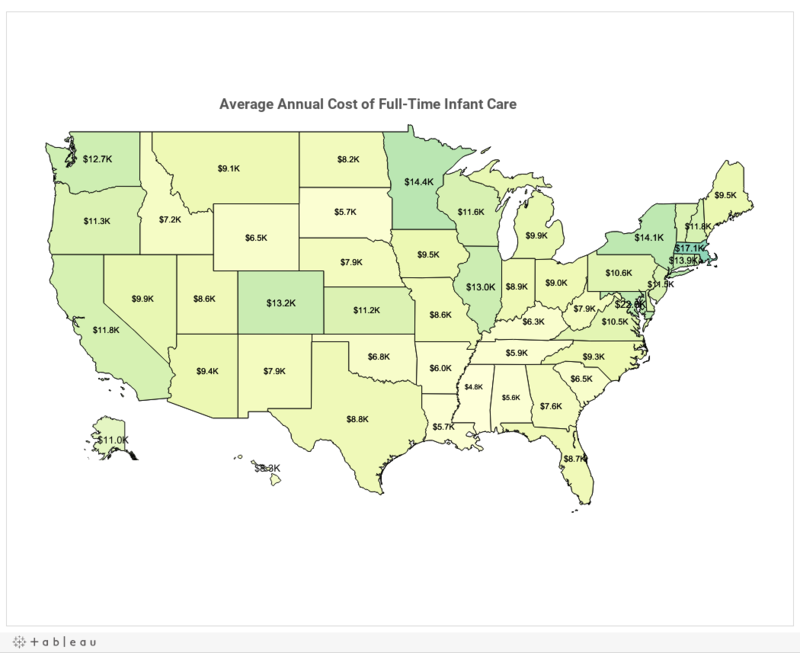 Using 2014 data made available by ChildCare Aware, we looked at the average annual cost of full-time child care—infants only, and data for one-child only—and created a couple of data visualizations to give you an idea how your state stacks up. 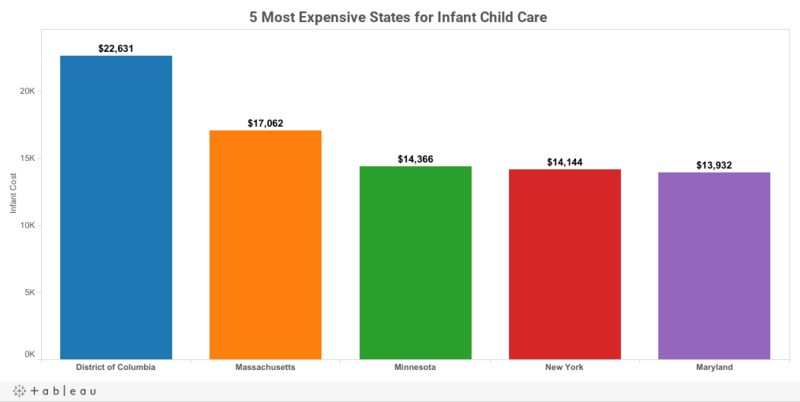 The five most expensive places for infant care in the United States are Washington, D.C., Massachusetts, Minnesota, New York, and Maryland. Minnesota is the most expensive state for infant care as a percentage of income, with child care accounting for more than 15% of median married household income (the national average is 11.8%). Washington, D.C. is the most expensive area for infant care compared to the cost of public state college tuition, with child care costing more than 200% more than state tuition (the national average is child care being 10.3% more expensive). 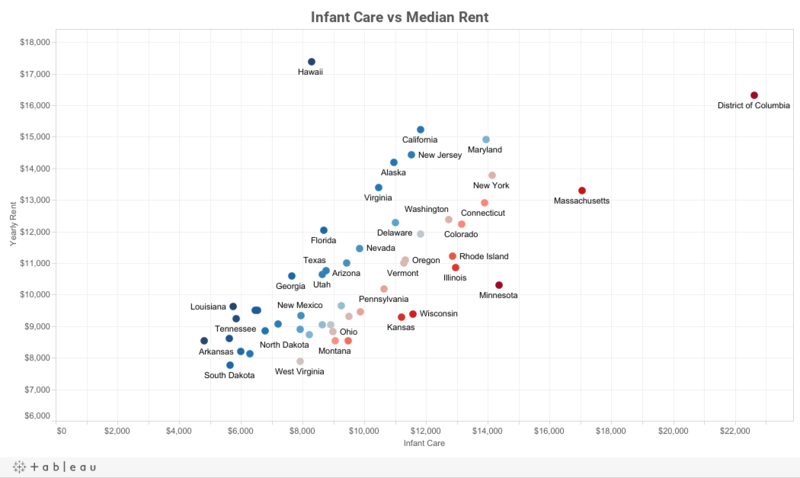 Minnesota and Washington, D.C. are also the two most expensive areas for infant care in comparison to median annual rent, with child care in both areas costing nearly 40% more than rent. Here are the top 5 most expensive states for infant care, with Washington, D.C. leading the way with an average care cost of $22,631. But instead of just looking at the raw totals, we can slice up the data to see how much child care expenses account for the total of the median income for married households in each state. (Again, all data comes via ChildCare Aware). You might be surprised to learn that Minnesota actually has the most expensive full-time infant care costs in the country, as a percentage of income, accounting for 15.2% of married household income. Oregon, New York, Massachusetts, and Colorado are right there as well, with infant care accounting for about 15% of a married household's median income in those states. 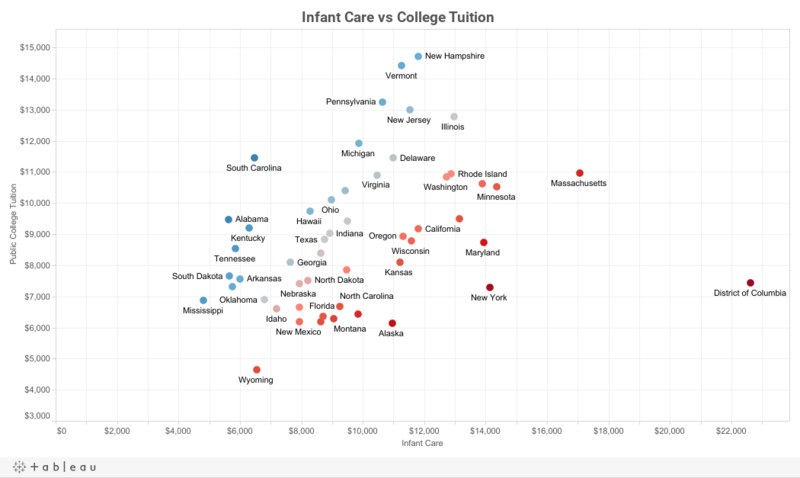 Another interesting data point to compare child care costs against is the average public college tuition in each state. Well, on average, using the ChildCare Aware data from 2014, infant care in the United States is actually more expensive—by a factor of more than 10%—than the national average public college tuition. Washington, D.C., really sticks out here, where infant care is more than 200% more expensive than the average public college tuition. If you're a parent, you've probably heard the saying that the cost of day care is like having a second mortgage payment—and for many states, the data bears that out. While at a national average level, the cost of infant care (again, for one child) is slightly less expensive than the national median rent (by about 8%), several states are not as lucky.​ (Note: for rent data, we used the Department of Numbers website). 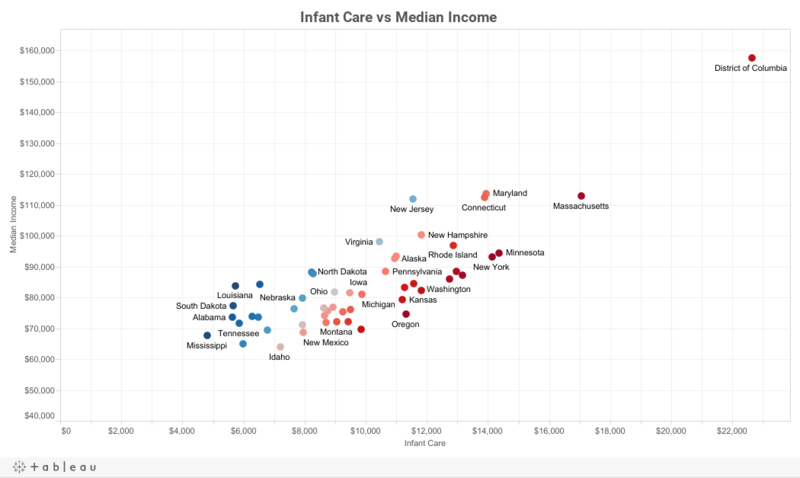 We see some of the usual suspects show up here too, with Minnesota, Washington, D.C., and Massachusetts leading the way with their infant care costing between 25%-40% more than the median rent in their states.